Smart jewelry as a trend has been bubbling under for the past three years or so and now we've reached the stage where, no matter which piece of jewelry you'd like to see smartened up, there's a couple of different options. Startups like Bellabeat, alongside big names such as Swarovski, Michael Kors and Kate Spade, have been quick to realise the potential of these form factors, and have created some beautiful designer jewelry that does more than just look good. With added smarts for fitness tracking, notifications and stress management, the next generation of earrings, necklaces, bracelets and rings is set to be connected. Read on for some of our favourites. This unisex smart ring, Motiv, promises fitness tracking from the finger. It's very smartly built - titanium, just 8mm wide, two finishes of rose gold and slate grey, plus seven sizes to cater to men's and women's hands. As for features, the real impressive thing here is that Motiv has managed to get an optical heart rate sensor into this form factor. There's also a 3-axis accelerometer for tracking steps, distance, calories as well as sleep. Battery life is five days, the ring is waterproof up to 50m and it now works with both iOS and Android. Check out our full Motiv Ring review for an in-depth look at how it performs. The Bellabeat Leaf Urban features a bunch of lifestyle tracking options from a slick looking device (seen clipped onto the model's vest, above). Stress levels are monitored by the Urban, by recording the wearer's breathing patterns, and now the companion app will tell you how rested/prepared you are to deal with stress that day. The device - like the Leaf before it - can also help women track their menstrual cycles and advise them during periods of ovulation. Step and sleep monitoring is part of the comprehensive feature package and this leaf-shaped wearable is smaller and a bit funkier than its predecessor too. The latest Bellabeat device is the Leaf Chakra which we'll be testing soon - the feature set is the same as the Leaf Urban but this time, you get gems such as rose quartz and onyx. It can be worn as a clip-on accessory or a pendant necklace. One of Fitbit's latest fashion collaborations is with New York label Public School. The results have divided our office, and may only look good if you're a model with a minimal wardrobe, but the collection for the Fitbit Alta is definitely a different take on fitness tracker accessories with a masculine, modern look. It includes this unusual take - the Axis is a hand polished, stainless steel watch frame for Fitbit's stylish tracker. There's also some safe braided bands. 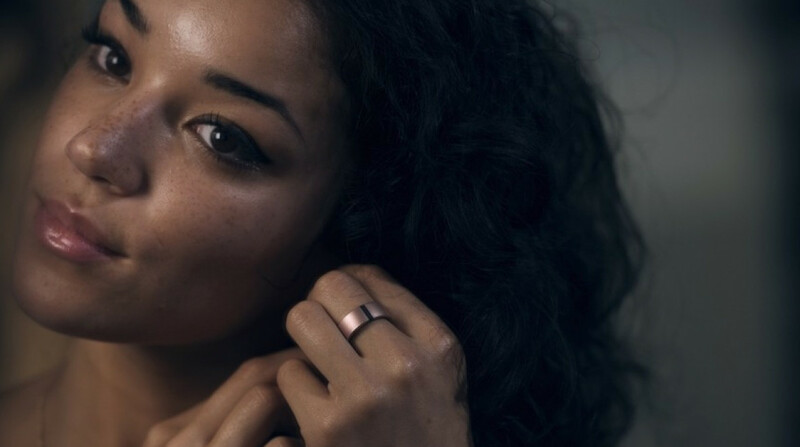 A smart ring with a difference, Oura is all about tracking and analysing your sleep. While not exactly dainty, it's fairly inconspicuous, with three colours and sizes 6 - 13 to choose from. Plus, instead of just spitting data about light and REM sleep at you, the app instead gives you a readiness score each day, based on your previous night's sleep. It works by measuring heart rate, heart rate variability and pulse amplitude through the night. The upgraded Oura Ring has just landed with a new look and features including the ability to monitor resting heart rate, body temperature and heart rate variability. Keep a look out for our review of the next gen smart ring coming soon. Fitbit has legions of fans already, and these Tory Burch cases in jewelry form are a great treat for Flex and Flex 2 owners. The American designer has brought her signature style to these open, gold-plated pieces - necklaces and bracelets make up the range. They're certainly elegant, even if you can see the Fitbit peeping through, with metal hinged and fret bracelet styles still on sale. Tory Burch accessories for the Fitbit Alta and Alta HR, including a Resin Inlay bracelet in turquoise/gold and navy/gold, also landed in late 2017, so if you've picked up Fitbit's latest fashion-friendly tracker, these could be a nice upgrade. The sparkly Shine is an official partnership with the design work done by Swarovski's in house team in France, rather than the crystals being bought in bulk and stuck on. The Swarovski Activity Crystal - previously the Swarovski Shine - features all the same tracking technology as its forefather the Misfit Shine and cheaper cousin, the Misfit Flash. That means step and activity tracking, as well as sleep monitoring, with results delivered via the Misfit smartphone app. More solar powered Swarovski Shines are reportedly in development and this one is massively discounted on the Misfit site. If you're the kind of person who's got a note app on their phone filled with ramblings, gibberish and a list of stuff you'll never get round to watching on Netflix, then Senstone is the smart jewelry for you. Senstone records voice memos, translates them into text and then organises them for you in an app. It can be worn as a bracelet or necklace, and is designed to blend in about your person. The LED indicates that it's recording, but other than that there are no giveaway signs that there's any technology in this at all. We don't usually recommend Kickstarter projects, but our US editor Hugh Langley tried Senstone, and it's the real deal. One of the biggest names in fashion has been spending the last few years building up its connected arsenal, with its smartwatches also joined by bits of connected jewelry. One such piece is the Access Thompson (above right), which alongside the Access Varick (above left) adds more than a dash of glamour to a circular mother of pearl fitness tracking module. As well as activity, you can track sleep and get smartphone alerts as buzzes on your jewelry-clad wrist. The stainless steel Thompson bracelet is available in rose gold tone and silver tone and has pavé accents around the module and on the bracelet itself. The Access jewelry isn't available to buy on Michael Kors or Amazon - that might mean the lines could be refreshed for 2018 over the next couple of months. Kate Spade's line of designer, activity tracking 'n' alerts wearables includes this Bangle Tracker. It's available in three styles, all of which feature mother of pearl, scallop detailing and a 'Seize the day' inscription. If you want something a bit preppier, there's also the Scallop Tracker which features spotty, stripy glittery and cat ears styles and a Metro Grand hybrid watch which we have actually tested. The Bangle Tracker is out of stock or not showing at Kate Spade and Amazon - but that might be because it's due a refresh for autumn.